This Computer Desk Description: Desk Materials: This contemporary computer/office desk offers a sleek modern design crafted with particle wood and heavy-duty powder-coated metal frame. Size:The desk size is 47.3L * 23.7W * 29H inch provides a large space for laptop or monitor and printer while the design creates a look that is both attractive and simple. We also have larger size which is 55 inch table, meets all your need. Multi-functional: You can use it as computer desks, office desk, training table, meeting table in your office or can also use it as a dining table/dining desk, coffee table in your home and can also use it as activity tables, exhibition table etc. This folding desk compliments for any occasion. Brand Profile: • Professional Manufacturing Experience Need Corporation over the past decade has specialized in wooden and metal household furniture. We continue to expand our product categories, most recently into home appliances and housewares. With fifty (50) production lines, we design, manufacture and ship traditional to modern furniture designs throughout Europe, North America, Central and South America, Japan and China. • Premium Quality Guaranteed We supply for several high-profile brands in North America, Europe and Australia. You can expect our product quality to be in line with those top brands and the only difference is LOGO. • ISO9001 Certified, PRC Famous Brand NEED Quality Management System is ISO9001 certified and we are one of the few factories achieved it in early days. Our brand is recognized as "PRC Famous Brand" in domestic market. 【Overall Size】Open: L47 x W23.7 x H29.5 inch, Folding: L47.3 x W23.7 x H2.5 inch; Weights about 31.7 lbs, Max Weight Capacity: 222 lbs. 【Quality Material】Environmental E1 standard particle wood board, waterproof and anti scratch. Heavy-duty powder-coated metal frame, 1.57 by 1.57 inch, which provides strong enough support. 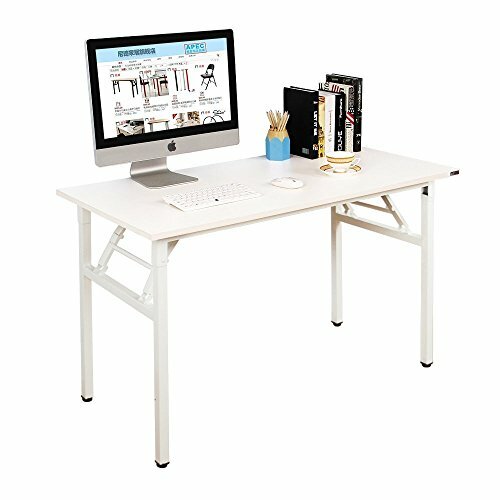 【Multi-function】Can be used as computer desk,computer table,writing desk,office desk, training table, dining table, meeting table, exhibition table etc. 【Advantage】 1.No Need to assemble, can be opened and folded in a few seconds; 2. Can be adjusted in 1-2 cm in length with leg pads, makes the desk stay stable on uneven floor.